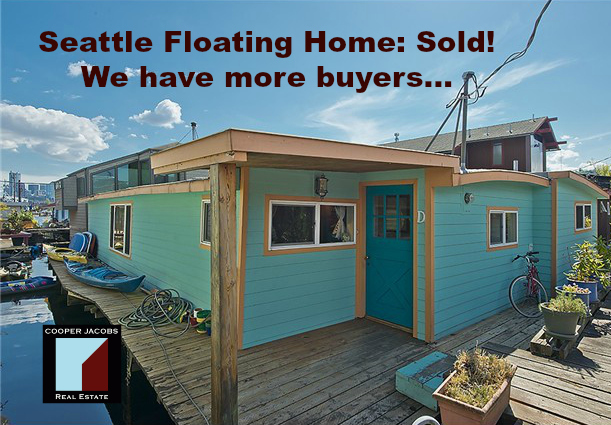 Seattle Houseboats For Sale: Just SOLD in Eastlake! 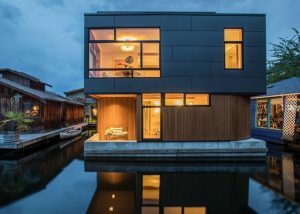 This particular Seattle floating home has a special place in our hearts due to its sentimental background. Though not as famous as its Sleepless in Seattle cousin across Lake Union, this Seattle houseboat is perhaps just as iconic! Located on one of Eastlake’s longest running and most organized cooperative dock, The Log Foundation, this 1930 floating home has had lots and lots of action – even as it was moored in one place and not moving. It was owned by a very longtime and loved Seattle houseboats resident and the home was practically a floating dance hall in its day. We have recently nicknamed the home “Art” after its previous owner and look forward to seeing the new owners enjoy it as much as he reportedly did. There are lots of stories across the lake about the parties that almost always broke out into full on dance soirees and you can tell just by walking into this houseboat that it has had a happy life. We are so thrilled to see it have a loving new chapter. A little more about this special home….. So back to the sale itself – Seattle houseboats for sale always are exciting, but closing one is also a cause for celebration. Congratulations to Molly and LeAnne for doing such a great job getting it sold. It closed in escrow on 10/13/2015 at a final sales price of $677,500. The floating home has two bedrooms and is 1300 square feet. It has a rather large float for its size and great dock position. It also is well oriented to the lake which is something you don’t always get. Moorage for a recreational boat is possible alongside the home with the permission of the co-op. It also had extra spaces which could function as an office or another nonconforming bedroom. The home is all one level and has the most charming curved ceilings. I was always very taken in with the large open living space and the beautiful spaces throughout. It never felt like a two bedroom home – more like a home with all kinds of possibilities in every corner. As I write this, I personally regret not buying it myself – such a wonderful place with great energy, but alas, there will be other Seattle houseboats for sale and each one is unique and special. 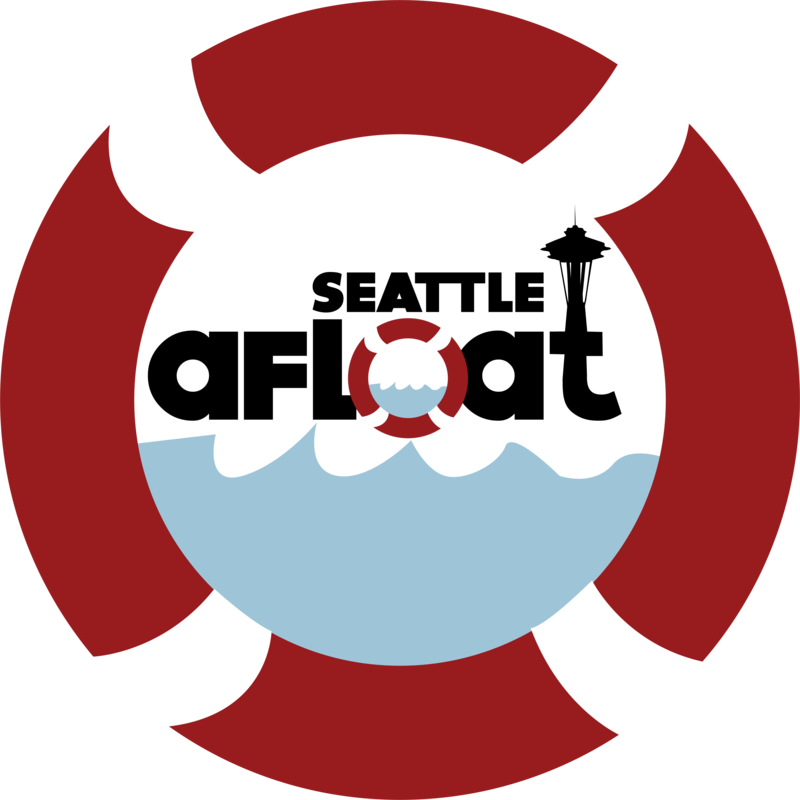 Please call us if you are interested in learning more about Seattle houseboats for sale – We look forward to helping you buy or sell your next Seattle houseboat, whether it is a Seattle floating home, a house barge, or a floating on-water residence. 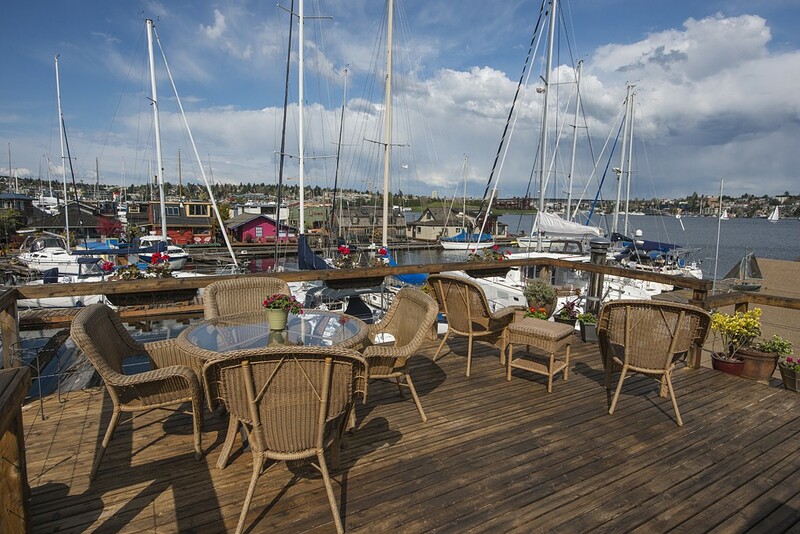 We are excited to help you learn about the lovely Lake Union as well as Seattle Houseboat Living℠. Colorful Seattle Houseboats History on The Log Foundation docks of Eastlake in 2014. Image courtesy of Cooper Jacobs Real Estate. To look at all the colorful and cheery Lake Union floating homes today is to never know how truly Seattle houseboats history is. 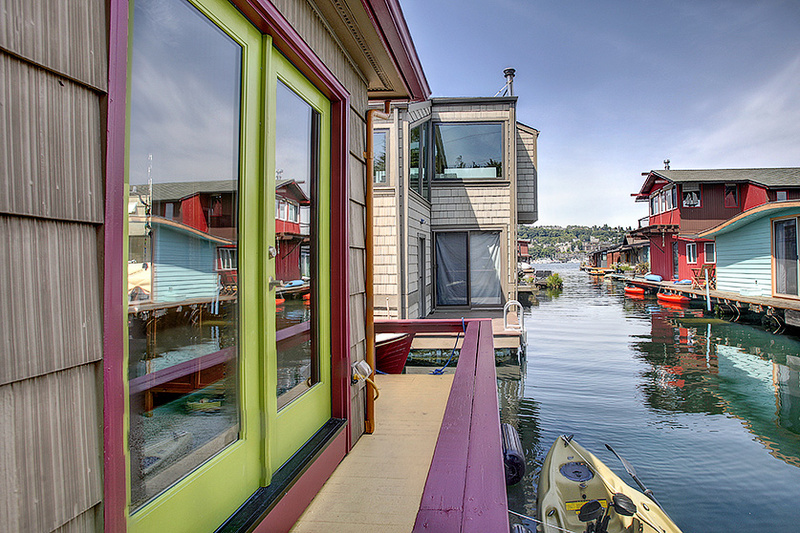 Seattle floating homes are a living and evolving part of Seattle’s history. From their humble beginnings over a hundred years ago as floating shanties compiled of pillaged lumber, it is amazing to see that some sell for over $3 Million dollars in today’s real estate market. Seattle houseboats were originally built in two different ways. Either the worker would utilize his commuting work boat and build living quarters above it, or they would gather “loose” logs and raft them together to build a completely free floating structure. It was an inexpensive way of living and was tax free on top of it. 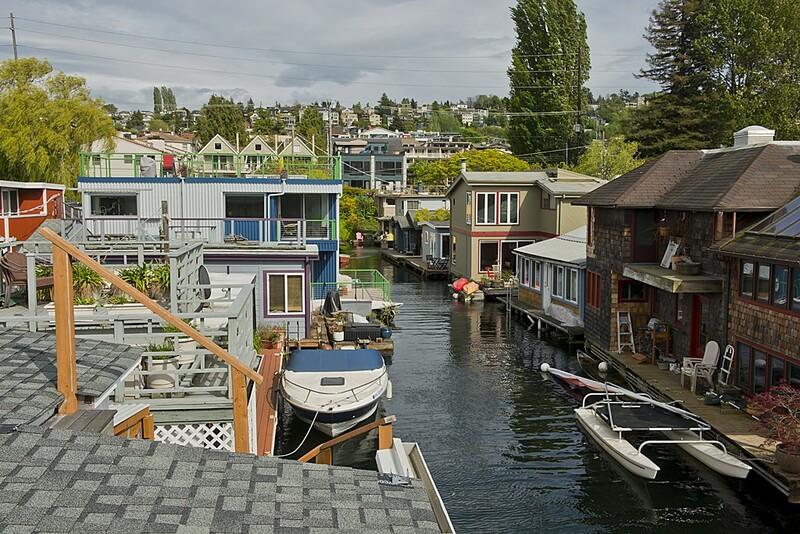 At the peak, the Seattle floating homes community was as large as two thousand houseboats lining the shores of the city in various locations which even included Madison Park in Lake Washington. The residents of the surrounding Seattle neighborhoods reportedly snubbed them and looked down at this way of life. They apparently felt that it was beneath their standards and so began the struggle of Seattle houseboats to Stay Afloat In Seattle™. 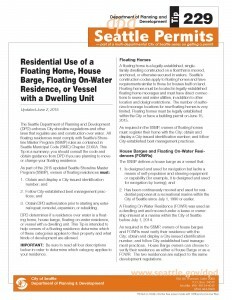 Today there are around 500 Seattle floating homes and probably another two or three hundred liveaboards that are officially newly categorized as Seattle Floating On-Water Residences (final count once all have registered themselves in the latest legislation). 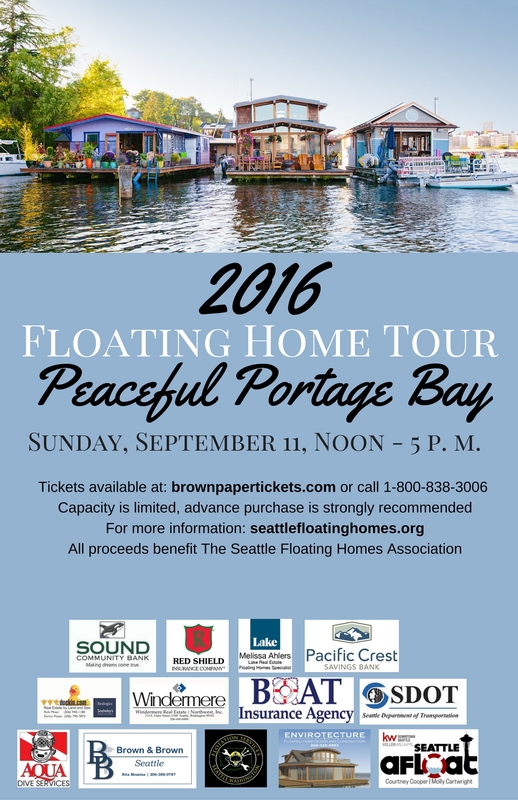 The latest Seattle floating home dock was a new construction floating home development called Ward’s Cove. Very specific requirements need to be in place in order to develop new construction Seattle floating homes, so it is next to impossible to do so. If The City Historically Wanted Them Gone, Why Did They Allow Docks To Begin With? The short answer is The University of Washington. Wait. What? The long answer is that Seattle has a very long history of making some incredibly hairbrained decisions as far as infrastructure goes. A perfect example (and my apologies for going off subject here for a minute, but….) The Denny Regrade: The hill is too big? Scrape it into the Puget Sound. In 1900, the city decided to basically eliminate a whole hill which covered 62 city blocks. Denny Hill was a significantly beautiful hill in Seattle. It had a gorgeous crowned jewel of a hotel atop it that was so grand that even President Theodore Roosevelt stayed there! It had an old cemetery and a beautiful park on it with expansivel views in all directions. In all, they removed a reported six million cubic yards of earth. Connecting the dots: What does this all have to do with Seattle houseboats and The University of Washington? Let’s go backwards. The modern day campus of The University of Washington was largely laid out and shaped by The Alaska-Yukon-Pacific Exposition of 1909. In 1907 the city of Seattle platted and sold the submerged “parcels” in Lake Union to the adjacent waterfront property land owners. This enabled docks to be built and Seattle houseboats to be moored to them. According to The Lake Union Mail on an article about Submerged Parcels Park on the Cheshiahud Loop, “The “Lake Union Shore Lands” were created in 1907 as a funding mechanism for the Alaska-Yukon-Pacific Exposition (S.B. #101). Water extending from shore approximately one block (roughly 400 feet) was platted as buildable land, then sold. These parcels didn’t sink, they started sunk. And they were considered valuable.” Now you know how a World’s Fair, Denny Hill, The University of Washington, and Seattle Houseboats are related. While replacing the carpet for one of our Seattle historic houseboat listings in 2010, we found an old booze hatch left over from Prohibition days. 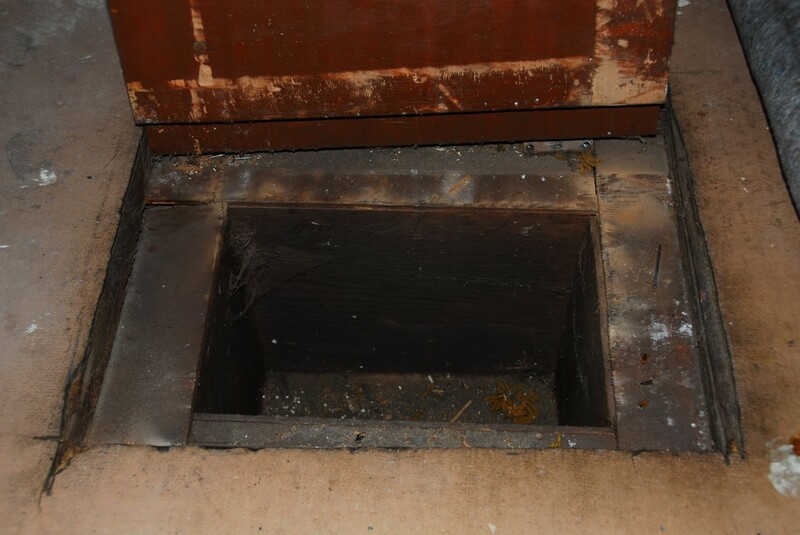 Image Courtesy of Courtney Cooper. 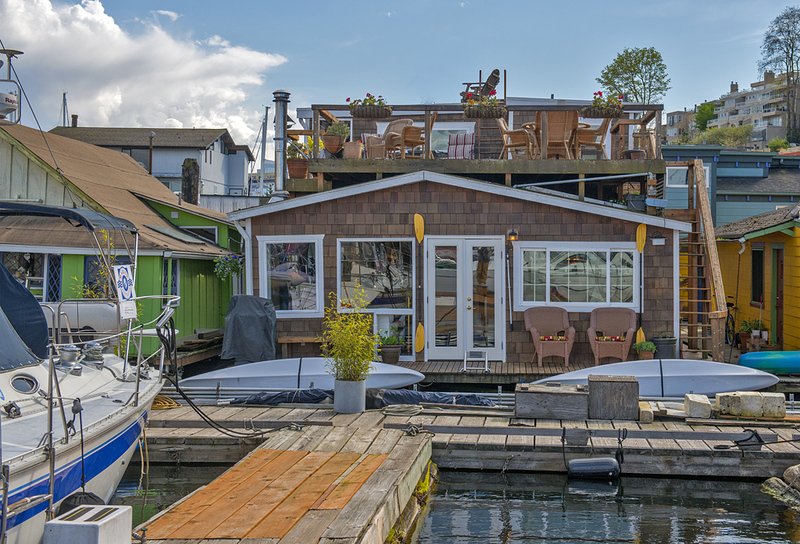 More Shady Past on The Lake: Life Afloat In Seattle℠: You Want To Stay Dry, Except When It Comes To Your Drink…..
Creativity has always been a strong characteristic of the Seattle floating homes community. This was never so true as during the prohibition era. According to the 1996 article by Sharon Boswell in The Seattle Times, “But for those who couldn’t afford the pleasures of Doc’s or one of the hundreds of other boozy night spots and music clubs along Jackson Street, in Belltown or even on Lake Union houseboats, there was always a bottle of locally produced bootleg available to consume in the privacy of home.” If floating homes seem like an unlikely place to get your alcohol fix then consider that In his highly acclaimed book, “Seattle’s Unsinkable Houseboats”, Howard Droker tells the story of a very enterprising entrepreneur who along with the cedar bark he sold off his boat, also sold smuggled Canadian liquor. 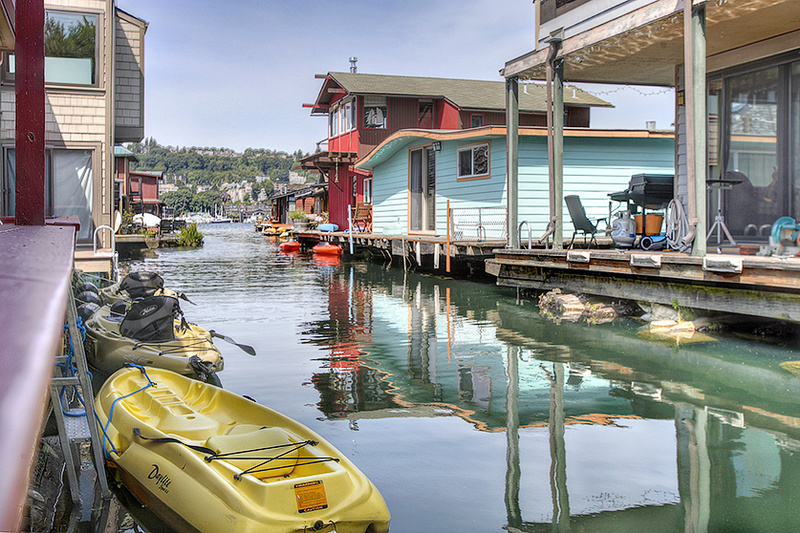 Go experience their magic – Take a kayak tour through Lake Union and Portage Bay where you will find what is left of the Seattle floating homes community. Take a walk around Lake Union on the Cheshiahud Loop. Lake Union is the very heart of the city. Try and imagine the colorful past as you look at the beauty and creativeness which is so abundant today. This is a living and breathing Seattle neighborhood, but also a significant part of Northwest history. It is as vibrant as the wonderful people who live in it. I am so thankful to have known so many of them and appreciate how they have enriched my life so far. 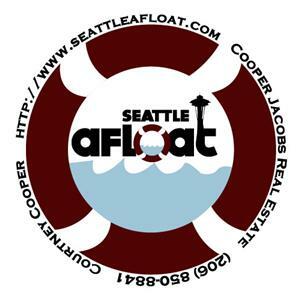 Please also take a minute and donate to the Seattle Floating Homes Association if you can. Want more information on Seattle houseboats? We are happy to help! Please call Courtney or Molly. We are Seattle Houseboats Experts ℠, and have been Seattle Realtors specializing in floating homes and waterfront for many years. We look forward to helping you find your piece of Lake Union. In the last sixty days, there have been many significant sale in the Seattle houseboat community. There have been nine closed sales in the NWMLS for Seattle floating homes and also for Seattle houseboats which are classified as a barge (house barge). 2727 Fairview Ave E #3 This is a grandfathered in Seattle housebarge which was gorgeous. It has 2 bedrooms and was listed on 4/5/2015 for $399,000 and sold for $404,000 after 6 days on the market. It is located on the Hamlin Pier in Eastlake. No sales tax on Seattle housebarges for sale if you can find them. 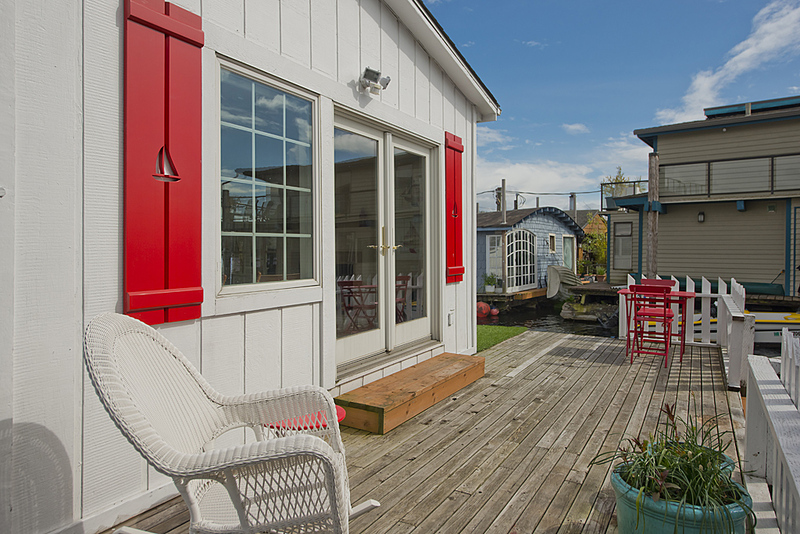 3125 Fairview Ave E #B This 2 bedroom 875 square foot Seattle floating home was listed on 4/30/2015 for $575,000 and sold for full price three days later. I closed in escrow 5/29/2015. 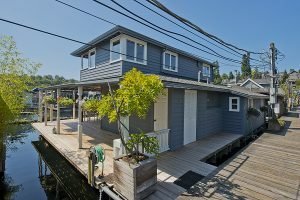 2727 Fairview Ave E #12 This Seattle floating home is on Hamlin Pier which is a leased dock in Eastlake. It was listed for $695,000 on 3/6/2015 and on the market for 22 days before closing on 4/30/2015 with a final sales price of $675,000. 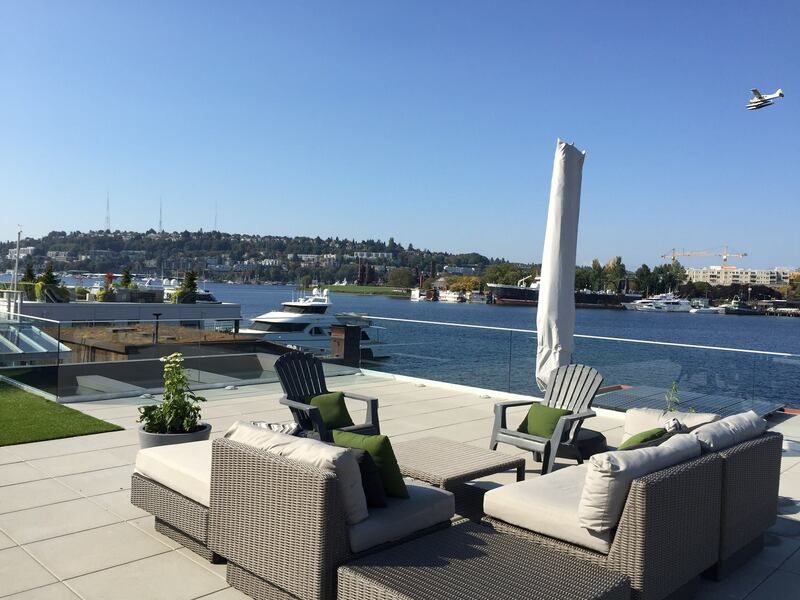 2031 Fairview Ave E #P The Lake Union Dock in Seattle’s Eastlake neighborhood. The next three sold on this dock. The floating home in slip #P is 1050 square feet and 2 bedrooms. It was listed for $725,000 on 4/28/2015 and after 3 days on the market sold for $715,000 and closed on 6/5/2015. It is the first houseboat on the dock. 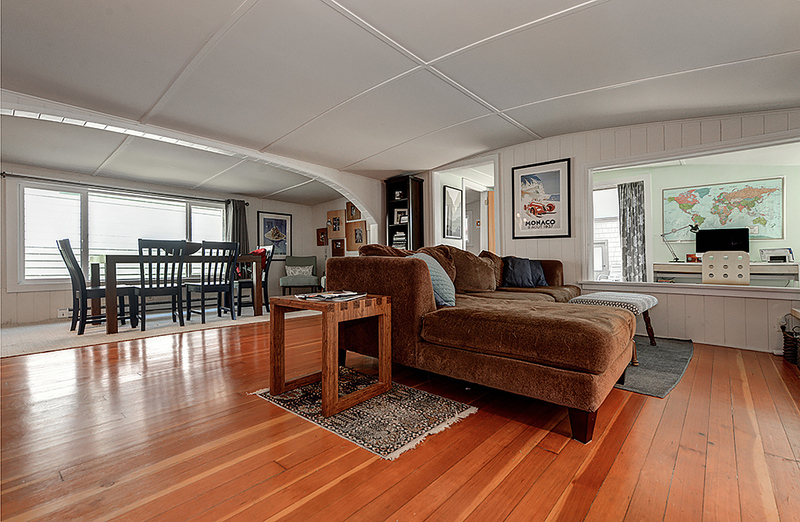 2031 Fairview Ave E #B Another Lake Union Dock gem, Molly and I sold this gorgeous Seattle houseboat to our lucky clients who came out ahead in a fierce multiple offer situation. This two bedroom 1200 square foot floating home was listed on 4/1/2015 for $895,000 and sold after six days on the market and closed in escrow on 5/19/2015 for $900,000. 2031 Fairview Ave E #G Molly and I had the pleasure of listing this one with LeAnne. We listed it on 4/27/2015 for $975,000 and after 5 days on the market it went under contract for full price. During the inspection, we adjusted the price somewhat for a final sales price of $971,000. It closed on 6/10/2015. 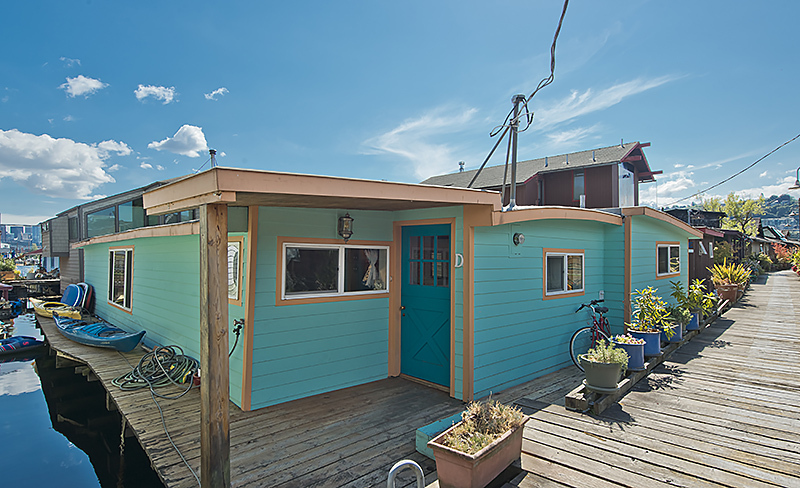 This Seattle floating home is a two bedroom 1184 square foot houseboat in Eastlake. It is second from the end of the dock and offers some pretty great views and nice finish work. 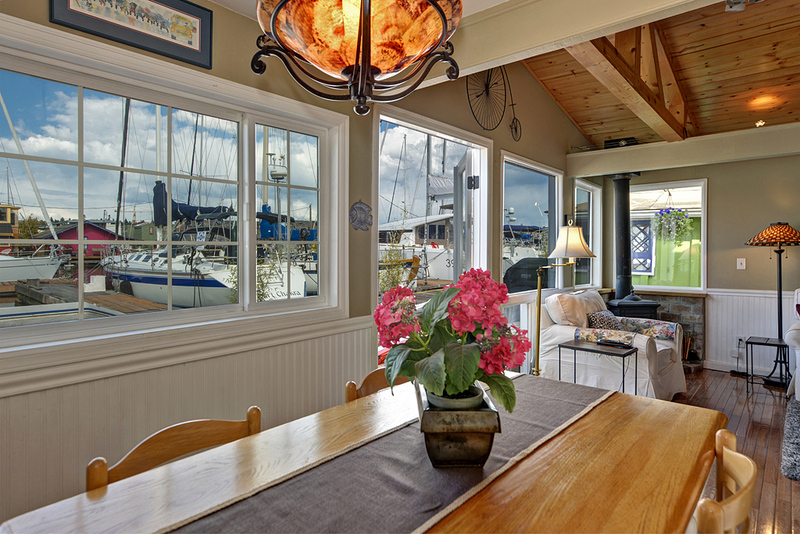 3236 Portage Bay Pl Moving over to Portage Bay, this two bedroom Seattle floating home was listed on 9/15/2014 for $1,100,000 and after 152 days on the market, it closed in escrow at $1,067,000 on 5/15/2015. 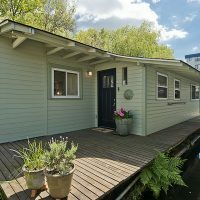 This houseboat offered a unique situation which make it difficult to price – a couple parking spaces and an on land rental income opportunity. People looking for Seattle houseboats for rent would like the land rental and this one also has no HOA so no dues. 10 E Roanoke Reef St #12 Awwe… Roanoke Reef floating homes! 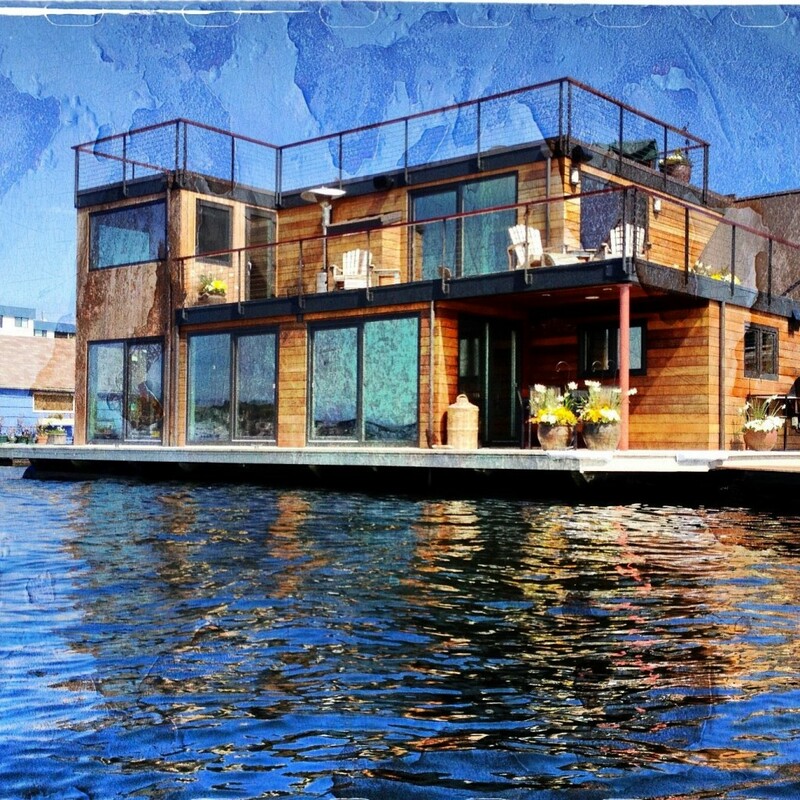 Roanoke Reef is one of the three standards in Seattle luxury floating homes. 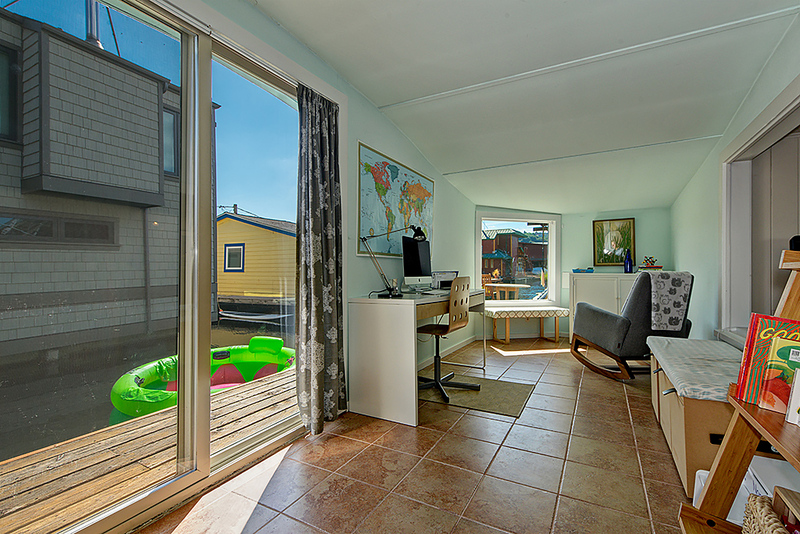 This three bedroom floating home is on the back row and offers 1562 square feet of living space to stretch out for your life afloat in Seattle. It was listed for 4/5/2015 for $1,690,000 and after 276 days on the market sold for cash. It closed on 5/8/2015 for a final sales price of $1,640,000. 3212 Portage Bay Place #B Brand new! Seattle new construction floating homes in Seattle are few and far between. This one is back over in Portage Bay again and is one of the latest Seattle luxury floating homes to hit the houseboat market. It was listed for $1,750,000 on 3/28/2015 and after 35 days on the market it sold for full asking price and cash and closed on 5/27/2015. The square footage is 1850 square feet of stunning interiors and three bedrooms which is difficult to find outside of Roanoke Reef, Mallard Cove, or Wards Cove. So the average days on market for these Seattle houseboats for sale is 56 days. The average dollar per square foot is $751.95 with a range of $657.14 to $1,049.94 for the Seattle floating homes and $404 for the Seattle housebarge Big Brother that closed. The median sales price for all of these Seattle houseboats is $900,000. 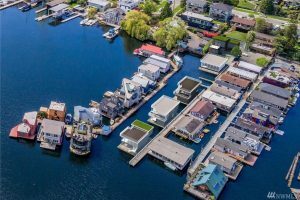 The sales price to list price ratio is 99.02% making the Seattle floating homes market a healthy opportunity for Seattle buyers who want to be in city but can’t seem to compete in the current market. In Seattle land homes for certain neighborhoods, homes are selling for $100,000 to $200,000 and more over list in the same price range. Why not take your buying power and apply it towards Seattle’s most affordable waterfront and closest in city neighborhood? We still have multiple offers in the Seattle floating homes market, but the competition is at a more reasonable pace. 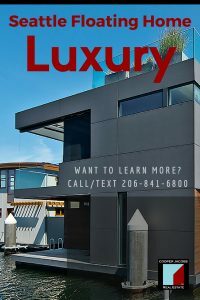 I think if more buyers were aware of the attainability of this amazing lifestyle, then more people might jump in and enjoy this unique lifestyle of life afloat in Seattle. 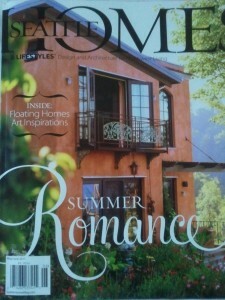 Please call us if you would like to learn more about living life on Lake Union. 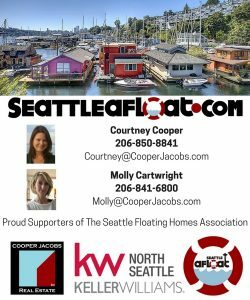 Courtney Cooper or Molly Cartwright 206-841-6800 Seattle Houseboats Realtors. We specialize in Seattle floating homes, Seattle waterfront, Seattle luxury homes, and Seattle neighborhoods. Cooper Jacobs Real Estate, SeattleAfloat.com for Life Afloat In Seattle’s Lake Union Neighborhood.